There are plenty of vacations spots that are absolutely beautiful and inexpensive at the same time. The Hawaiian Islands are most certainly not one of those destinations, but they are certainly worth the cost. Does that mean you cannot visit the beautiful beaches and the turquoise waters without breaking the bank? Thankfully, that’s not quite case yet, but you will need to follow some of the tips as mentioned below to make it happen. Airlines such as Southwest, United and Hawaiian Air usually offer the cheapest flights, but you should always check to find the best deal on that specific date. As a general rule though, it might be best to check in through Honolulu. 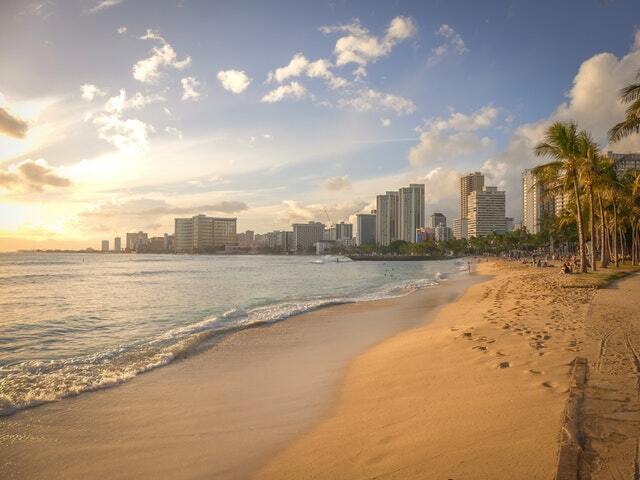 As is the situation with all popular holiday destinations, Hawaii vacations are the cheapest when it’s off-season. Thankfully, off-season doesn’t necessarily translate to a dull vacation. In fact, it might actually be a good thing as the lack of a bustling crowd everywhere means that you will have a better and more exclusive experience on these beautiful islands. The so called off-season includes the last two weeks of January and the months of February, May, September (Aloha Festivities is the big attraction) and October. Hawaiian food trucks are famous for providing ultra-low budget meals that taste awesome so rely on them for most of your meals and avoid big restaurants, especially at places that are crowd hotspots. If you must eat at a restaurant, make sure it’s either a lunch or you are there before the clock strikes 6 p.m. because the same meals will become more costly once it’s dinner time. If you are particularly picky about what you eat and would like to cook your own food, the local farmer’s markets offer fresh fruits, vegetables and meat at very affordable prices. They may not be the most luxurious options available, but most hostels in Hawaii do come with free Wi-Fi, parking, breakfast and shuttles to the beach and airport. You will find plenty of hostels on Maui, Big Island, Honolulu and almost everywhere else. Do check with them before arriving at location because even in off-seasons, it isn’t unlikely for the hostels to fill up pretty fast. The best part about going to a beach destination is that you can enjoy most of the activities there without having to spend a lot of money and in some cases, you won’t have to spend any money at all. Go on a trek through the Kalalau Trail in Kauai or Diamond Head on Oahu if you are looking for an adventure. You can also simply relax and enjoy at the nearest beach with a picnic or enjoy beach parties at night with a healthy dose of Hula dancing. Come to think of it, as long as you don’t care much about the tourist traps, you won’t really be missing much at all on your budget trip to Hawaii.